Pokkén Tournament is due out in the west sometime in spring and hype for it continues to grow. Just recently, Sceptile was announced as a new fighter, and Electrode and Farfetch'd were announced as Support Fighters. At any rate, it seems that there's a bit of a dearth of modern fighting games on the Wii U, so this should make a nice addition to the library. 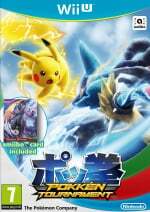 Pokkén Tournament is available in arcades all over Japan and each machine is outfitted with controllers that somewhat resemble the control layout of the Wii U GamePad. Perhaps in an effort to make sure that those who honed their skills in the arcade will have an easier time transitioning to the Wii U version, it's been announced that a variant of the Pokkén Tournament controller will be made available for the Wii U in Japan. The peripheral will be made by Hori and it launches on 18th March in the region. What do you think? Would you like to see this come west? What do you think of the design of the controller? Share your thoughts in the comments below. 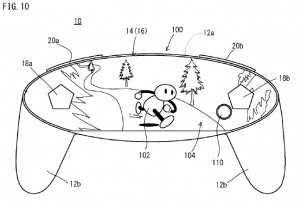 This could be the possible NX controller as well?! 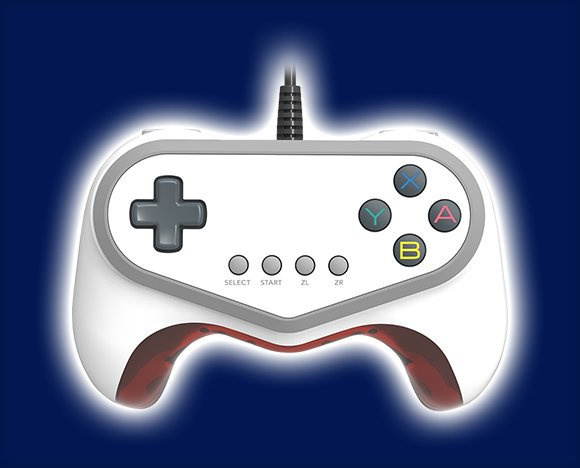 It looks like a 3rd party pad from the 90's. IKR. Just replace it with glass/screen. I'm hoping for a limited edition game + controller bunderu to get released in the PAL territories. Meh. Wired, no thumb sticks. Still better than getting a GC controller adapter though. Hopefully they make enough to sell in all territories or in enough numbers for people to be able to import if they want it. Not for me, but many would love it - and would look nice with a Pokken Tournament logo. I really hope this is compatible with other Wii U titles. 2D games like NSMBU, Freedom Planet, Shovel Knight, Ducktales, plus VC titles would play beautifully plus the wired nature means no battery concerns. Probably will import just to make sure I get one in case no PAL release. Wired into what? The WiiU has no controller ports. USB? But why? This is literally the worst controller I've ever seen since the N64 and XBOX! It lacks control sticks, ZL/ZR are completely misplaced, and the design is appaling! This thing is a perfect testament of NamcoBandai's utter incompetence towards anything related to fighting games! Why would anyone want such an utterly useless and ugly piece of garbage?! ...oh right, because Pokémon. That's the worst dedicated fighting game controller I have seen. I wonder how the D-Pad is, I wonder if it has rumble and I wonder if it's comfortable... it doesn't look it! The arcade controller looked pretty bad too. When it comes with fighters like this I would like to use a arcade stick, welp there is always the fightpad I got. Oh yes defo bundle with Pokken Fighter plz. I don't like it. It's ugly. I'd rather get the GameCube-shaped Classic Controllers instead (there are so many of them and I don't actually need any more classic controllers, so I can't really be bothered collecting them all). I do hope that hori releases a new arcade stick for the wii/wiiu in honor of poken.... I need a pcb. @Tsurii I think it looks really ugly too, and no analogue stick. @Kaze_Memaryu Maybe because its for the type of game that doesn't need control sticks or easily accessible ZL & ZR? Fighting games generall need no more than 6 buttons and analogue sticks are generally inferior for such games amongst the dedicated fighting game fanbase. Somewhat surprised so many people complain about the lack of analogue sticks without realising what the controller has been designed for. I'm not even a fighting game fan but I've read up and talked to several people who are and generally all the most popular "fighting" pads have either just a d-pad or a low micro-switch equipped 8-way stick. @abe_hikura Thats good to hear. I use Hori's Fighting Commander pro 3 on my PS3 & PC for 2D games and retro titles. I am searching for a 360 type pad for a load of Japanese shm'ups I recently bought but so far no luck. At least the 360 controller with transformable d-pad is good enough. Never has one machine proved how inadequate its primary controller method is . Great for fighting games, NES, SNES, and GBA games. Not so much for anything else. I don't really understand the "blank slate" design either - couldn't it at least have a Pokken Tournament logo or Pikachu or something on it? And that milky white exterior is going to show dirt like crazy. But, for those people psyched for this game, this will probably be the preferred way to play. @Splatburst The Hori controller does look like it's missing something in the middle. They could've squeezed a screen in there, like something Dreamcast-sized or something. Or maybe like the fight controller back in the Street Fighter/Mortal Kombat days that you could program special moves into - that screen could go there. @russellohh Do you mean the USB ports? I do not see any wired controller ports on the Wii U.... What the heck am I missing? @msvt i said USB, which have been the controller ports on the xbox, pc, ps3, ps4, xbone etc for over a decade. They're controller ports! That's what USB do! oh I see. I think with the GC adapter using two ports for controller + I have the other two USB (wiiU) for external HDD. I was imagining these ports to be more like a hidden panel like on Wii. I've never used wired controllers on other consoles. All good! Why is ZL+ZR in the middle...? Because this is literally the arcade controller released for Wii U. The reason why there is a dearth of fighting games on Wii U and Nintendo systems is the fact they don't sell well. Fighting games have pretty much only done well on Sony systems since PS1, with Saturn and Dreamcast being the sole exceptions. For some reason fighting games don't do well on Xbox and Nintendo systems. @Kaze_Memaryu First off, fighting games are always far better with the D-pad, any avid fighting game player will tell you that. Secondly, there's a very large Tekken and slightly smaller SoulCalibur following that begs to differ on your constant belief that Namco are in any way incompetent when it comes to fighting games. As I'm pretty sure I already explained to you before, no fighting game can ever be perfectly balanced, that would defeat the whole point and make the game boring while every character would just be a reskin with a different set of animations. The whole point in fighting games is to learn each characters strengths and weaknesses and overcome them in order to win, remove that and you have a mindless button-masher with no gratification or skill involved. Tekken and Soulcalibur, Namcos two primary fighters, pull this off (almost) perfectly, albeit with a few stupidly cheap characters people hate (I'm looking at you, Maxi, Nightmare, Jinpachi and Azazel, to name a few... T_T) but the many outweighs the few. Anyway, I feel this controller looks pretty neat and comfortable, depending on the size, albeit with slightly cheap looking plastic. I also feel it could be a pretty nice collectable since it's a replica of the ones on the arcade machines (something some people here seem to have failed to notice), much like how the Power Glove is now despite it being an awful piece of tech. @kamifox1 You really don't understand much about fighting games, do you? For starters, no. Every fighting game enthusiast will tell you to get an arcade stick,, and even then, many professionals still use the control stick for circular inputs due to the low input buffer in certain fighters that makes it borderline impossible to get complex inputs done. Next thing, I don't care what the fans claim, every single Soul Calibur and Tekken title had some of the most amateurish balancing issues in fighting games, and every Tekken has at least one infinite loop. Them being blindly loyal to their favourites has no merit over that. Then, your idea of perfect balancing is seriously limited. Proper balancing means equal chances regarding advantages and disadvantages between charcter movesets, not the same moves for each character. Look no further than Garou: Mark of the Wolves, which easily has THE best balancing of all fighting games, yet still provides a very distinct cast of characters. Or Guilty Gear, which has some unbelievably crazy characters, yet only has slight issues with tier lists. NamcoBandai doesn't even come remotely close to that. Their fighters are historically unbalanced, which is why many have close to no representation in fighting game tournaments, except for Tekken, which always abides to the "infinite loops = disqualification" rule imposed by the tournament holders. Otherwise, the game would turn into an overglorified version of Divekick (which is also better in terms of balancing, despite being a simple parody): first hit wins. So, no. You're wrong, simple as that. When you tell me NamcoBandai fighters are well-balanced, I pull off an infinite or abuse overly generous iframes in every single one of them. @Kaze_Memaryu I also forgot to say, Namco are so incompetent with fighting games, both games are highly acclaimed by both critics and players alike, with, again, a very loyal and strong following containing a very large amount of people. I really don't see how you can claim incompetence when, time and again, their games achieve high scores and are highly praised. They're clearly doing something right otherwise they'd have the same notoriety as, say, the Sonic franchise and SEGA as a whole of late. Or, y'know... Pro Controller. Same face button layout, and I already have enough to use for a two-player fighter.